Product weight is 0.14 lbs. Recharge up to 1500 times * Low Self Discharge: Batteries maintain 75% charge after 3 years of non-use * Pre charged and ready to use * 800 mAH power * No memory effect The new SEC-HR4U4BPN 4-AAA eneloop battery pack utilizes SANYO's advanced rechargeable battery technology allowing them to last longer than ever before! They provide excellent performance-to-cost advantages over both conventional alkaline and other rechargeable batteries. Unlike disposable batteries which can only be used only once and are wasteful to the environment, the new eneloop batteries can be recharged up to 1,500 times. They come pre-charged, can be used immediately out of the pack and maintain 75% of their charge for up to 3 years when not in use. Eneloop batteries deliver reliable battery performance when you need it the most! Second-gen eneloop better than the first - by a hair, April 30, .. 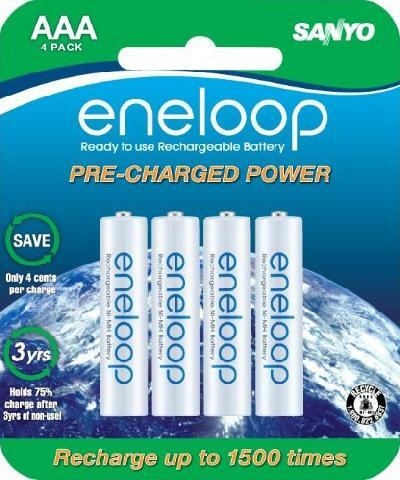 This package () contains four second-generation eneloop AAA rechargeable batteries. I have tested those cells using my old . Here are my findings:- Right out of the package, the average remaining charge is 640mAh, or 80% of the rated capacity (800mAh)- After the first recharge cycle, the average capacity increased to 839mAh.- After two more recharge/discharge cycles, the average capacity leveled off at 843mAh, or 5% higher than rated capacity.The above is very consistent with the results I obtained last yea.. I have been using Sanyo eneloop low-self-discharge NiMH batteries since beginning of 2007, and I'm completely satisfied with them. 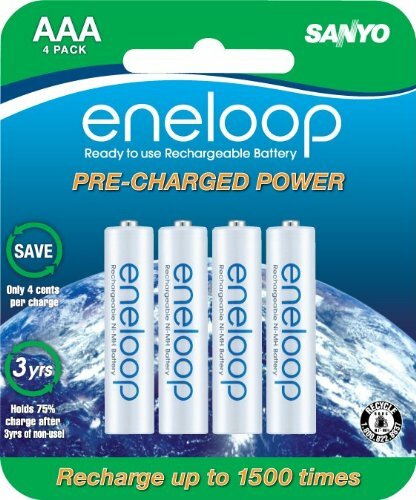 One thing I noticed is that newcomers to the rechargeable battery arena often have similar questions/confusions about eneloop. So here is my list of eneloop Frequently Asked Questions. This list is work in progress.Q1 My Sanyo eneloop AA batteries say '1900mAh' on them. Are they counterfeits?A All eneloop AA cells (both original and second-gen versions) are rated for "Typ 2000m..
Those are genuine second-generation eneloop cells - as far as I ..